Every floor plan is available in both a traditional and contemporary design scheme. For details about these design schemes, click here. Move into our All-Inclusive Apartments, and enjoy a fully furnished unit — and one simplified bill that covers it all. Our All-Inclusive Apartments include living room and bedroom furniture, a TV, lamps, cable, high-speed internet and more. Leases as short as 1 month are available, too. Learn more about our furnished apartments here. We offer a variety of ways to see inside our luxury apartments! 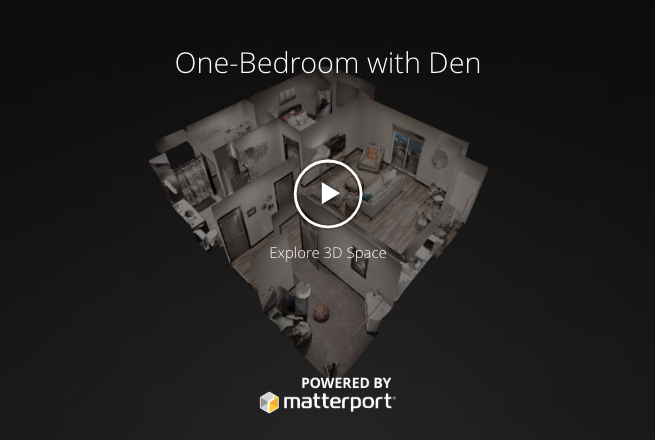 3D and virtual tours — Have you checked out our 3D and virtual walkthrough tours available? FaceTime tours — Get a personal tour of your future home without ever leaving your current home. This option works great for people on the go or who are or moving from out of state or country. When you contact us, simply indicate you'd prefer a tour via FaceTime! In-person tours — We love showing people around our community in person! Contact us to schedule a tour or use our convenient, online scheduling assistant to find a time and date that work best for you.